1 of 3 Heat oven to 400 degrees . In a small bowl, combine cumin, salt, cinnamon, turmeric, ginger and cayenne. 2 of 3 Heat olive oil in a medium pot over medium heat. Add half each of the shallots, garlic and spice mixture. Cook for 2 minutes, until soft. Stir in couscous and 1 1/4 cups water; cover and bring to a boil. Reduce to a simmer and cook for 8 to 10 minutes. Set aside, covered. 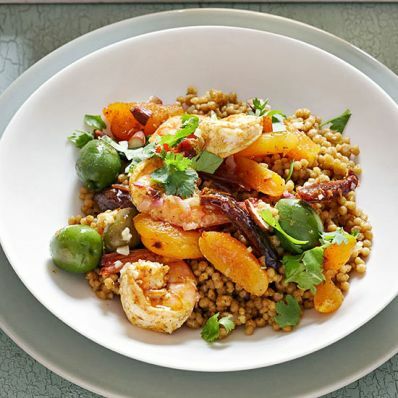 3 of 3 In a large bowl, toss shrimp with apricots, dates, olives, lemon juice and zest, wine and remaining shallots, garlic and spice mixture. Transfer to 2 large parchment cooking bags (such as PaperChef) and seal per package directions. (To make your own, see How to Make a Parchment Bag, above.) Place bags on a rimmed baking sheet. Bake at 400 degrees for 10 to 12 minutes. Carefully open to release steam; toss in a bowl with parsley, cilantro and almonds. Serve shrimp over couscous.